After a long career as a nature photographer I had never taken good pictures of Atlantic Puffins. I tried it in my first trip to the Lofoten Islands in summer 1985, but I failed as I chose to visit the wrong breeding colony (at the time the information was scarce and there was no internet). 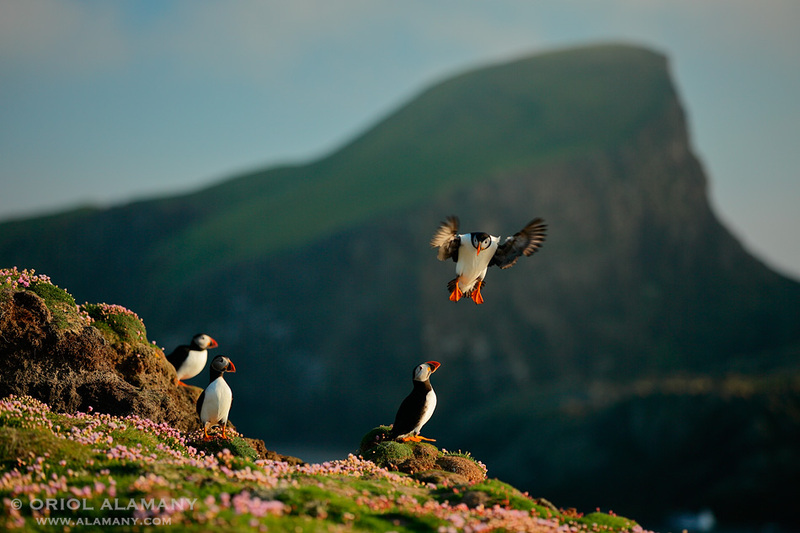 But last year 2013 I travelled to the Shetland Islands and finally got to photograph puffins at will for several days. This image was taken after dinner, when the light was beautiful. I took it with a short lens to show the rugged Shetland islands landscape and the carpet of colorful wildflowers. And you got one flying in. I don't think I've seen a picture of a flying puffin before.